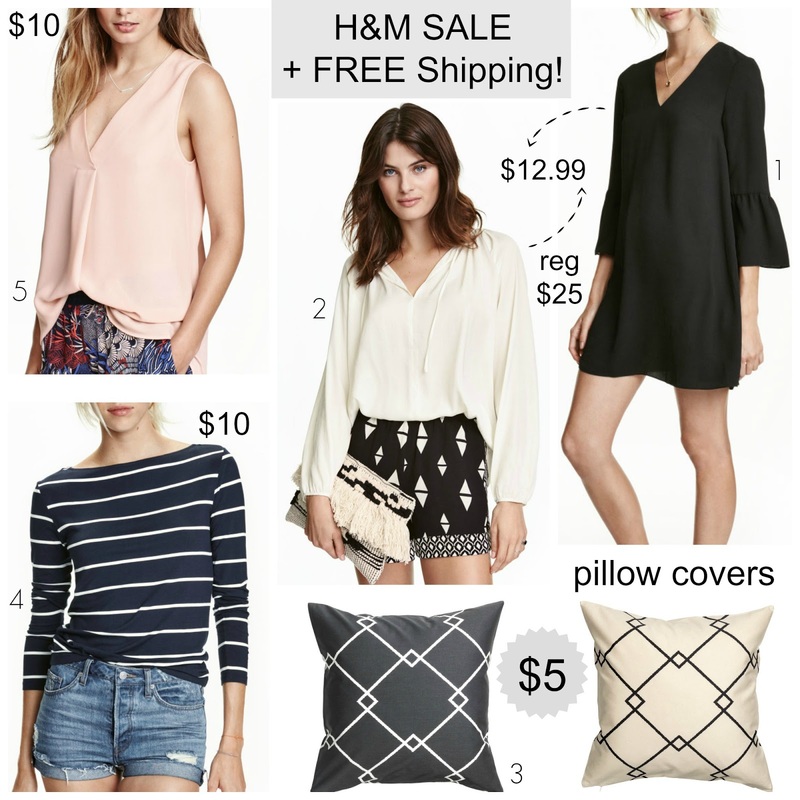 Tracy's Notebook of Style: H&M SALE (up to 60% off tops) + Free Shipping on ALL orders! H&M SALE (up to 60% off tops) + Free Shipping on ALL orders! I've been waiting for H&M to offer a free shipping deal so I usually will only buy one or two things at a time. Today only, they are having up to 60 % off selected New arrival tops! Remember that you can now return online orders to the store, which is huge if you aren't sure of your size. 1 Dress with trumpet sleeves $12.99 ($24.99) I actually saw someone trying this dress on in person and while it might not be everyone's style, I can picture wearing it into the fall layered with tights and booties and it's not as short as it appears on the model. 2 Satin Blouse $12.99 ($24.99) Perfect dressy top and it comes in a rust color if you are craving fall colors! 3 Cushion Cover $4.99 ($9.99) I was really impressed with the quality of their pillow covers and you can't beat the price to change the look of your space. I've never ordered the pillow inserts from H&M so I'm not sure of the quality since I already had some from both IKEA and Walmart. 4 Boatneck Top $9.99 ($14.99) I'm a stripe addict and love boatneck tops to wear with distressed denim like it's shown for a nautical with edge look. 5 Blouse $9.99 ($17.99) I loved this pretty top, a nice layering piece for work or a night out with denim. Oooh thanks for the heads up! H&M NEVER has free shipping!! You're welcome and love that you can also make store returns too, makes ordering so much less stressful! I love H&M sales! I often find things in store that aren't online either (and marked wayyy down). I'll be sure to check out this sale this weekend! Same here! Everything I usually love in store is always out of my size, have fun shopping! Thanks! H&M has some really cute things for fall right now!